Prayagraj : Hindus are not given any respect at Constitutional level in this country under the existing secular democratic system. Under article 28 and 29, there is provision for imparting religious education to minority communities; but there is no provision for imparting knowledge of ‘Sanatan Vedic Dharma’. There is Minority Commission to stop their oppression; but there is no Commission for Hindus forming majority population. If such discrimination is to be removed, word ‘secular’ should be removed from Indian Constitution. When this word ‘secular’ is removed, Bharat will become Hindu Rashtra. Then, it will be possible to protect all revered things like cow, Ganga, temples etc in Bharat. All Saints and devout Hindu activists need to come together for the same, stated Sadguru (Dr.) Charudatta Pingale, national Guide of Hindu Janajagruti Samiti (HJS). 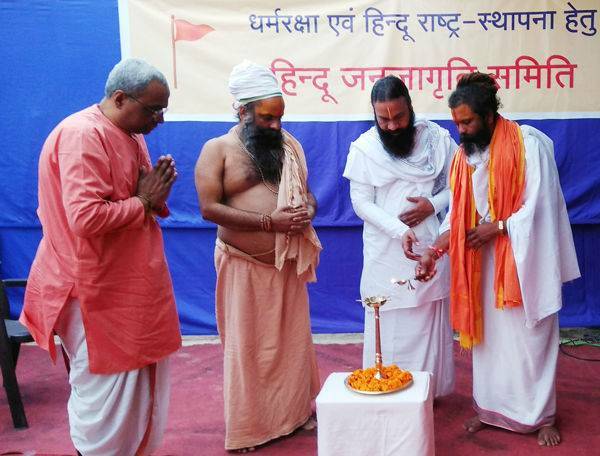 One-day Hindu Rashtra Convention was held at ‘Bhuma Niketan Pendal’ in ‘Kumbhkshetra’, Prayagraj by ‘Sant-samaj’ and pro-Hindu organizations for establishing Hindu Rashtra and Sadguru (Dr.) Pingale was the main speaker. Saints from different States, from various ‘aakhadaas’, Mahants, Mahamandaleshwars and representatives of pro-Hindu organizations attended the Convention; including dignitaries like H.B.P. Shyam Maharaj Rathod of Warkari Sampradaya, Mahamandaleshwar Swami Radhadevji Maharaj, Mahamandaleshwar Janardana Harigiriji Maharaj, Mahant Bhagirathiji Maharaj, Mahant Ramdnyaniji Maharaj, Swami Rajaram Maharaj, Omkar Agnivanshi Maharaj and Swami Ramabaliji Maharaj. Total 90 persons including Saints, Mahants, Sadhus and devout Hindu activists attended the Convention. ‘Batu’ Adarsh Tiwari and Abhishek kumar Pande, students of ‘Shri Dharmasangh Shiksha Mandal’s ‘Vedapathashala’ of Varanasi recited ‘Veda-mantras’ in the beginning of this Convention. Resolutions passed in Convention ! 1. 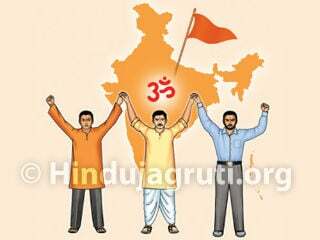 Word ‘secular’ should be replaced with the word ‘Hindu Rashtra’ in Constitution so as to declare Bharat as a Hindu Rashtra at Constitutional level. Nepal, which was a Hindu Rashtra till the year 2006, may also be declared as Hindu Rashtra by Parliament of that country. 2. 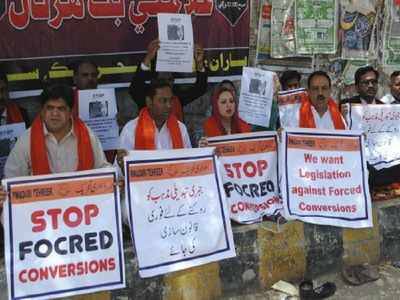 Displaced 7.5 lakh Hindus from Kashmir valley should be rehabilitated with full security in Kashmir. Union Government should create a territory for them in the name of ‘Panun Kashmir’. 3. Law should be passed by Union Government for protection of revered things like ‘Goumata’, Ganga, pilgrimage places etc of Hindus. 4. This Convention condemns State Governments of Kerala and Maharashtra for breaking religious traditions followed at Sabarimala Devasthan and ShaniShinganapur Devasthan respectively. Union Government should immediately pass a law in this respect for protection of Hindus’ religious traditions. 5. 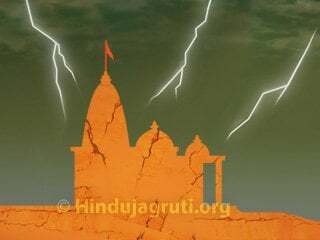 In the ongoing session of Parliament, the Union Government should issue an ordinance for construction of huge Ram-Mandir on ‘Ram Janmabhoomi’, paying due respect to Hindus’ religious sentiments. 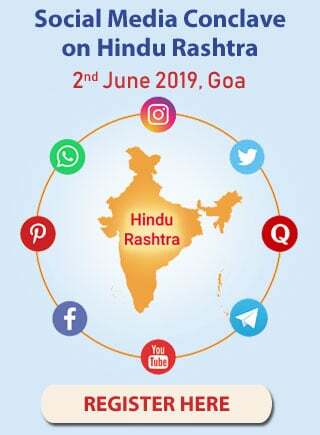 Most of the Saints commended Sanatan Sanstha and HJS for organizing one-day Convention on the issue of establishing Hindu Rashtra. 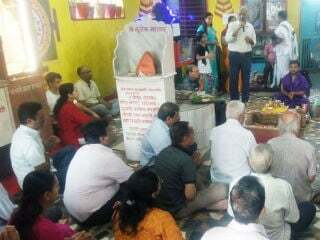 Advocate Arunkumar Gupta said while praising these two organizations, that Sanatan and HJS have started with one –drop of nectar through this one-day Convention during ‘Kumbh’ for establishing Hindu Rashtra. In one-day Convention held for the mission of establishing Hindu Rashtra, Saints-Mahants, Sadhus from ‘Shaiva’, ‘Vaishnava’ and other Sects, so also various regions participated in large number; similar to the ‘Triveni-sangam’ of Rivers Ganga, Yamuna and Saraswati at this place. 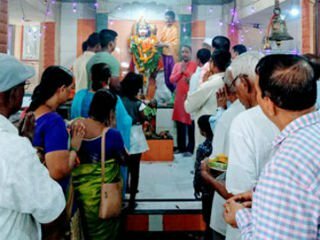 Sanatan Sanstha and HJS brought Saints on the same platform irrespective of their Sects and regions; for which all Saints expressed their satisfaction and bestowed blessings over Sanatan and HJS for future activities; including establishing Hindu Rashtra. 3. First Convention during ‘Kumbh Mela’ of political parties of all ideologies ! 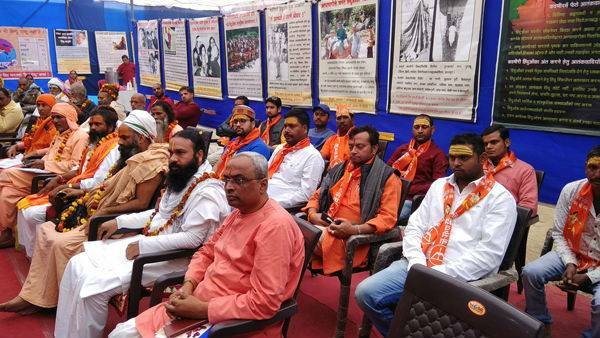 One-day Convention for establishing Hindu Rashtra was successfully held in ‘Kumbh-Mela’ by Sanatan Sanstha and HJS which was all-encompassing ideologies of all political parties. 4. Shri. Ravindra Pundit, the Founder of ‘Seva Sharda Peetha’ gave information on his efforts to open Hindus’ ‘Sharda-peetha’ located in PoK. Yogi Hansanath and other Saints-Mahants also gave guidance. ‘Pujya’ Rajaramji Maharaj of ‘Ramanuja Sampradaya’ from Satna, Madhya Pradesh; Swami Santoshacharya Sagar Maharaj, ‘Pujya’ Baiju (Kerala); P. Ramabalidasji Maharaj from ‘Shri Digambar Aakhadaa’, Gujarat; ‘Vaishnava Sampradaya’s Rajlalan Tripathi Shri. Hansnathji Maharaj, Satna, Madhya Pradesh; Ramanujaswami, Madhya Pradesh; Shri. Omnathji Maharaj of ‘Yogi Gorakshanath Sampradaya’ in Rajasthan; ‘Pujya Mahant Shri Shri 108 Sundardasji Maharaj of ‘Digambar Aakhadaa’, Vaishnav Sampradaya from MP; ‘Pujya’ Swami Sadanandagiriji Maharaj from ‘Akhand Mahayoga Sampradaya’; ‘Pujya’ Mahant Nareshgiri Maharaj of ‘Shiva-Mandir’ and ‘Gou-seva’ Sampradaya from Mevant, Haryana; Sadhvi Jyotsna Kusumgiri from ‘Sanatan Dharma Juna Aakhadaa’, Jammu-Kashmir; Sadhvi Dolly Kusumgiri from Sanatan Dharma Juna Aakhadaa, Jharkhand; Shri Shri 1008 Mahant Gopaladasji Maharaj; Shri Mahant Swami Shivamurtydas Shastri Maharaj from Shriram Mantra Sadhanapeetha, Ujjain Khalsa. Shri Shri 108 Shri Shri Mahant Swami Shivamurtydas Maharaj of Shriram Mantra Sadhanapeetha, Ujjain Khalsa had sent his best wishes from Hindu Convention. Boy whose thread ceremony is being performed.